“If it turns out that the Moon has a number of caves that can provide some protection from radiation and meteor showers, it could be an even more interesting destination than previously thought,” said veteran cosmonaut Sergei Krikalev, quoted in an article by Reuters. Krikalev served on board two different space stations and flew on the space shuttle. He now leads Russia’s Star City cosmonaut training center outside Moscow. He and Russian scientists discussed the possible Moon base a forum on the future of manned spaceflight. The image above is from the Lunar Reconnaissance Orbiter showing a cave or pit found in the Sea of Tranquility. Scientists have estimated the depth of the pit at over 100 meters, and several other caves have been found with orbiting spacecraft. 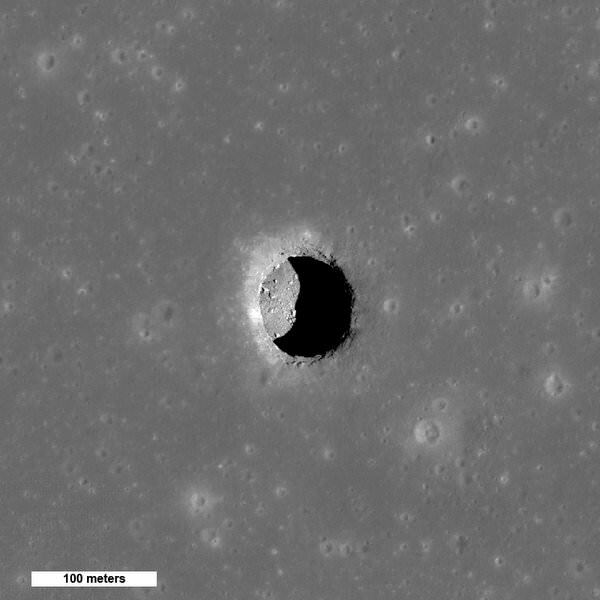 Lunar scientists are studying the images to determine if an extended lava tube system still exists beneath the surface. See our article on Moon caves. Reuters quoted Russian scientist Boris Kryuchkov as saying the first such lunar colonies could be built by 2030. Krikalev has more than two years cumulative time in space His first long-duration flight to the Soviet space station Mir was in 1988, and he did back-to-back increments on Mir flight starting in May 1991 and returning to Earth in March 1992. While he was in orbit, the Soviet Union disintegrated and Mir became a Russian space station. He became the first Russian to fly a Shuttle mission on STS-60 in February 1994. His second Shuttle flight took the Unity node to the International Space Station on STS-88 in December 1998. He was a member of the Station’s Expedition 1 crew, launching in October 2000 and returning to Earth in March 2001. He launched as commander of Expedition 11 in 2005. Thinking outside the box! It would be awesome to see a moon base that soon. We know the Moon has a fair number f collapsed lava tubes. Presumably there are uncollapsed ones, as well. Could Ground Penetrating Radar from an orbiter be used to locate these, and other potentially useful near-surface voids? Large enough and well protected enough for a lunar city. Are there any good candidates near the polar ice deposits? How about in the areas of high amounts of rare earths and titanium? Forget 2030, let’s aim for 2020 and do it. Off this rock, for safeties sake! Yes, what? Not enough context. I Knew the moon was made of Swiss cheese. And inflatable module with a hard outer-shell? I’m having trouble imagining it; I’d like to see some of the design sketches. DEFINITELY worth exploring further! I’d like to see a base set up in a far side lava tube, next or near to a perfectly circular bowled crater with a radio telescope installed… he dreams. Russia has never ventured beyond low-earth orbit. They’ve been making these grandiose proclamations since the 60’s. My guess they’ll remain in low-earth orbit for the next 100 years at least. Actually, what I would do is safely climb down into the pit, explorer, take samples and asses feasabilities. Then I would bring in the team and heavily spray the sides, floor and cieling with rigid foam and place a cap over the top of the hole. Next, I would move in survival equipment and take more meaurements and such. Then I would set up more and more elaborate shops to create stuff with existing materials. By products of low level mining is watter and oxegen. Eventually, we would find a few deep craters close by to cover over with translucent materials to make a few greenhouses to grow whatever in. Soon, in just a few short years, we have moonbase alpha! Point two is that there are vast riches to be found there. And used to create whatevers. The moon is our stepping stone to humanities need to survive itself and become a viable member of the cosmic brotherhood. Or, we can just stay on this silly backwatter planet and eventually use it all up. And die. I choose to survive. I choose life. I am a real starman and not just annother earthling. Yes.. an interesting scenario. I would add that instead of coating the interior with a rigid ‘foam’, that we set up a LARGE parabolic reflector next to the site. Then convert the collected solar radiation into a coherent beam and melt or anneal, the interior surfaces. ‘Vitrify’ the walls to create a ‘volcanic glass’ impermeable barrier. Extract O2 from nearby soils with reduction modification techniques (TBD), then pump the oxygen into the chamber for atmosphere. Hopefully soon, we will develop the robotics capable of performing tasks such as this? Come on kids! Get with the program.. study science and engineering but especially math in school. Then, within a generation or two? we can do this. NOT only on the Moon, but also Mars! Let’s go! Excellent idea. However, I chose foam because it is very cheap and easy and quick. However, just now I am thinking that it may need an atmospheare to set up. H-m-m, I wonder if it would work or not. Anyone? Your idea is much better butwould take a longer time frame, much more technology and more funding. Regardless, we have the technology to do this right now. Annother viable coating metheod might be to just place wire mesh over the surfaces and inject cement which can be colored and have any number of additives to it to do pretty much whatever one would need. Like glow in the dark as an example. I don’t know, man, but fuseing materials with high enough energies seems to me a more advanced further allong the colonizeation path technique. Very doable, latter on, but I just want to get a decent foothold first. Know what I mean, Vern!? Next PostNext Iceland’s Midnight Sun: a Time-Lapse Treat!